The year 2012 will mark the 100th anniversary of the sinking of the Titanic. This ship is still one of great mysteries of our age, thanks in part to fictionalized movies and actual facts. Sleeping Bear Press is releasing (as of November 1st) T is for Titanic: A Titanic Alphabet in honor of the occasion. 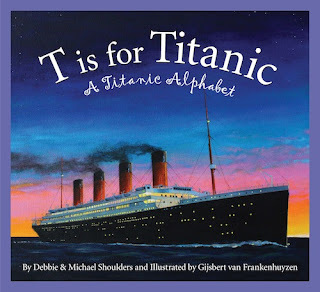 As per their usual layout, this book takes a look at the Titanic through the alphabet, from the Anatomy of the ship to Zimmerman, one of the passengers on board. Sometimes it's hard to describe tragic situations to our children but I think Sleeping Bear Press addresses the heartache that was the Titanic very well, commenting on how people in 1912 would feel about this disaster as we do an airplane going down or a train crash which injures many people. This book suggests that one of the best way to honor the memory of the Titanic is by telling stories about it. (I learned a thing or two about individual passengers and found it quite fascinating!) Definitely an intriguing book about one of the most intriguing and memorable transportation disasters that we have known in recent history. By the way, as an adult, if you are interested in learning more about the sinking of the Titanic, I still highly recommend Titanic's Last Secrets (which is linked to my review over at 5 Minutes for Books) which I found thoroughly engaging and enlightening. This book is also interesting in that it lists games which are no longer included in the Olympics, such as an obstacle course in the water and tug-of-war matches. The book also provides a list of the years and locations where the Olympics have been held throughout the years. 2012 is an interesting year, historically speaking. But then what year isn't? There are always sad things to remember, and happy things to anticipate. Thanks to Sleeping Bear Press, there are ways to introduce our children to both through books. My thanks to them for shooting copies of the above books my way to check out! I have two fiction books that are on the Titanic. This post makes me want to pull one of them off my shelf. I bet we'll be hearing a lot about the Titanic next year. The only book I have about it is The Titanic's Last Hero. Ooohhh! I want both of these!! You know my love for Sleeping Bear Press. I'd own everything they print if I could afford to buy them. 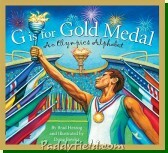 My older kids are taking gymnastics lessons this year so we will be watching the Olympics. I'll have to put together a unit study for us and this book sounds like it needs to be in the study.